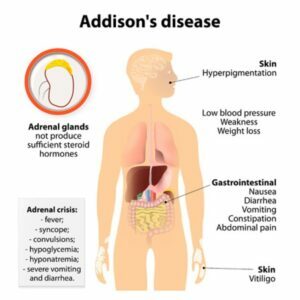 If the adrenal cortex is damaged and doesn’t produce its hormones in adequate quantities, it can result in primary adrenal insufficiency known as Addison’s Disease. Addison’s disease can commonly occur because of the body attacking itself and hence is an autoimmune disease. A condition known as secondary adrenal insufficiency can result if people abruptly stop taking corticosteroids. Corticosteroids are prescribed for asthma and arthritis. There are a number of symptoms associated with Addison’s Disease and some of these symptoms clearly correlate to the symptoms associated with traditional Chinese medicine disease patterns and these will be explored later. There are over 80 chronic autoimmune diseases including thyroid disease, multiple sclerosis and rheumatoid arthritis. Can Acupuncture help autoimmune diseases? Dianne Joswick, a Licensed acupuncturist practising in the United States says “Clinical research has shown that acupuncture causes physical responses in nerve cells, the pituitary gland, and parts of the brain“. It is then postulated that acupuncture can then help benefit the immune system. What symptoms of Addison’s Disease cross over with symptoms associated with traditional Chinese medicine patterns? Darkening of the skin, severe tiredness, lower back pain and craving for salt can be symptoms associated with kidney yang insufficiency and many traditional acupuncturists would use techniques to bolster the kidney energy when presented with an Addison’s patient. It is likely that these practitioners would also use moxibustion to warm and circulate the yang energy. Other symptoms associated with Addison’s disease may include nausea, diminished appetite, diarrhea and weight loss and correlate to Spleen yang insufficiency syndromes according to traditional Chinese medicine theory. Can there be more than once cause for Addison’s Disease according to traditional Chinese medicine? Yes, there may be a number of causes including Spleen yang and blood insufficiency, Kidney yin and yang insufficiency and Liver Yin and Blood insufficiency. Some of these patterns may overlap and the patient may have a combination of presenting patterns. Where would you put the acupuncture needles for Addison’s Disease? 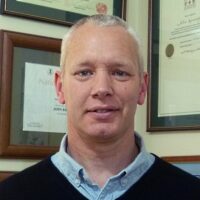 Alan Jansson has completed many hours of post graduate study in traditional acupuncture techniques in Japan and has been practising for over 30 years in Australia. He says “Depending on the cause, the location of points would vary considerably. What is important, is getting the root treatment down pat so to say. 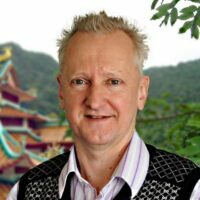 I often use abdominal points to bolster digestive function and in particular use a lot of specialist Japanese moxibustion techniques to work on the yang energy“. Acupuncture may be able to help those patients with Addison’s disease.